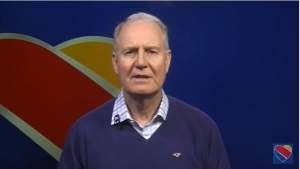 DALLAS (WBAP/KLIF)- Southwest Airlines CEO Gary Kelly addresses the FAA’s order for U.S. airlines to temporarily ground the Boeing 737 Max 8 series. “They will remain out of service until the FAA resends this order,” Kelly said. He said with over 750 aircraft in their fleet 95% are unaffected by this grounding. “Safety is our top priority, always has been and always must be,” Kelly said. Kelly said it’s concerning that still little is known in regards to the cause of Ethiopian Crash 302 and understands the need for grounding while the investigation continues. “I realize this disruption will inconvenience customers during a busy spring travel season,” Kelly said while apologizing. Kelly said to support Southwest customers, flexible re-booking policies are in place with no additional fees for alternate flights or dates.